While you are reading this I am escaping from home to go hang out with my friend Jodi and talk to an adult, craft until my fingers hurt, and stay up crazy hours. I am expecting to have a good time. It is hot here, kind of cloudy and humid, I do not feel like doing anything. It is 99 degrees here and almost 4 pm on friday the 26th, crazy! I will talk to you all on Monday have a great weekend. 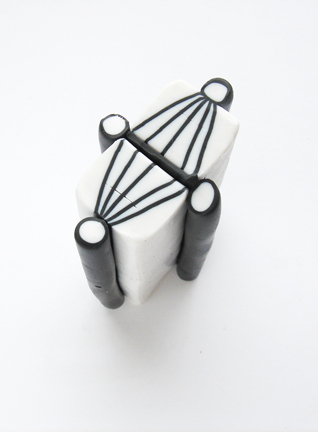 Make the canes from the Black and white tutorials. 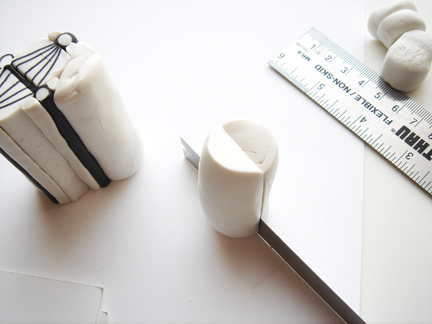 Save any pieces from the making of the canes that you have left over. We will use those. 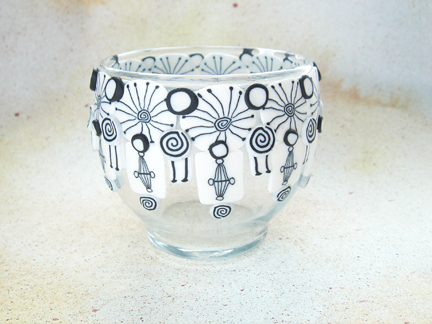 Start with the sputnik cane or I guess it could be a stylized dandelion, well whatever you want to call it. 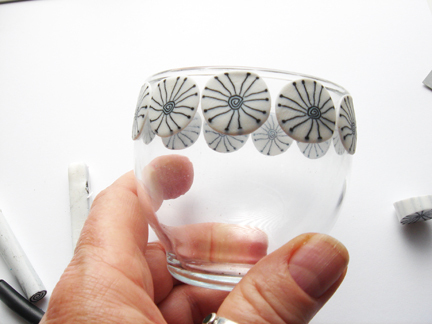 Slice off the slices about 1/16″ thick and place around the top of the glass. Do not press on just place. When you have them spaced evenly with about an 1/8″ between all of them. Place those below the others. These are from the second cane and are left over. Slice off some slices and round them a little with your fingers. 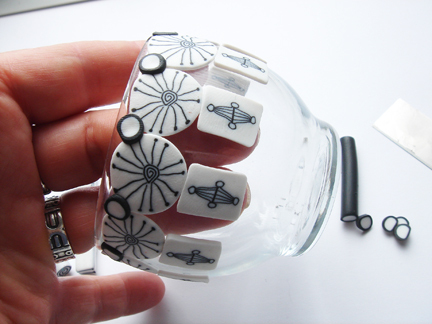 Place one of those between the big circles at the top of the rim of the votive holder. Now I have added the pieces left over from the dandelion cane and placed those between the rectangle canes. am building a net of canes around the top of the glass. I can have small open areas as long as all of the canes are connected together. 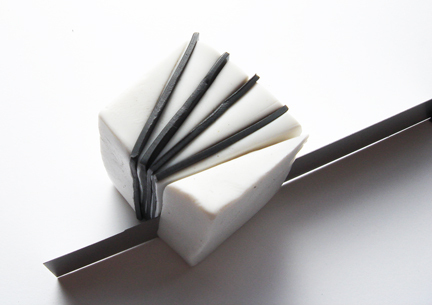 I rolled the spiral cane down to about 1/4″ and added one to each of the bottoms of the rectangles. Bake in a pre-heated 275 degree oven for 1/2 hour, shut off oven, and let cool in the oven. 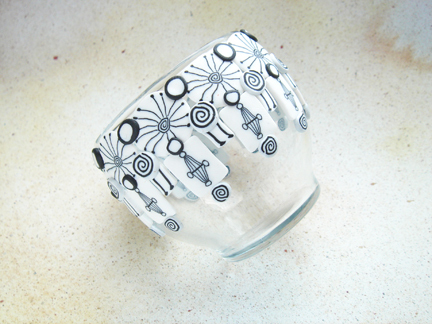 Add a votive and you are good to go! 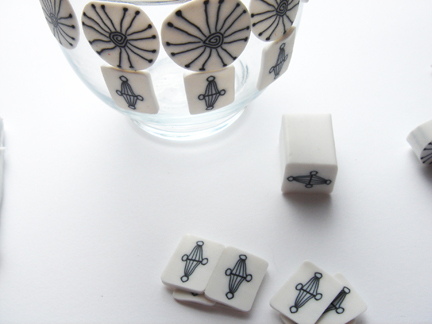 Fave Crafts Blog Hop- Black and White Canes #2 Atomic age influence part 4, and Happy Monday!! 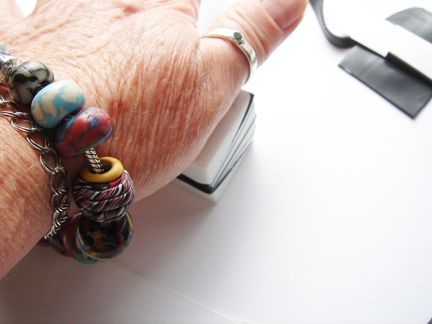 It is time again for the Fave Crafts Blog hop- finished on the 15th. 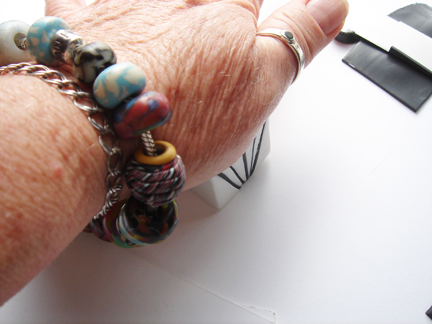 You can click on the link/logo to take to you to a Fave Crafts page with all of the other artists participating in this. 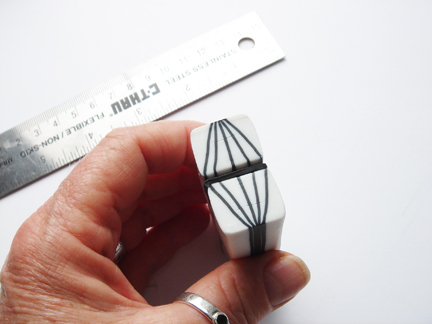 I am in the midst of a tutorial on Black and White canes with Cernit polymer clay. 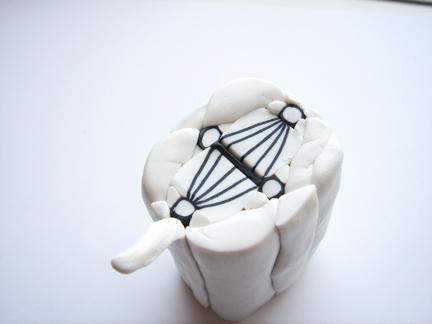 A cane is a method of making images in rods of clay by layering different colors of clay together to form that image. 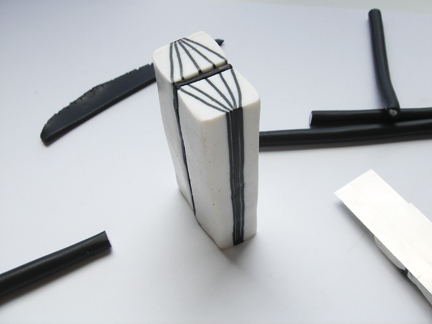 Then cross sections are cut of those rods and used in many applications like jewelry, and application to many different things like light switch plates, silver ware, glass, and ceramics just to name a few. The possibilities are endless. 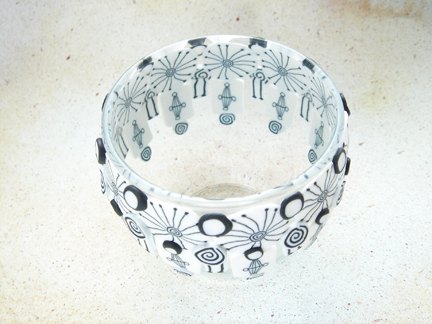 It is an adapted technique from ceramic and glass, in ceramics it is called neriagi and in glass it is called millefiori. Links lead to my husband’s store http://www.clayfactory.net/. Thank you for looking or buying, we appreciate it very much. It helps us eat and pay the bills. 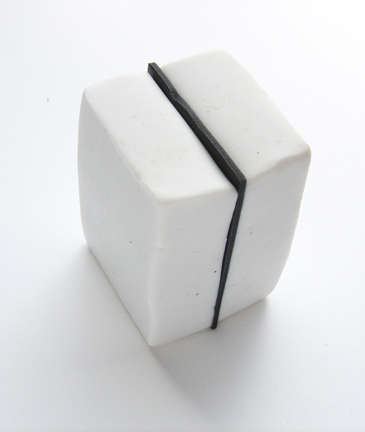 Mix the small blocks of Opaque white with equal amounts of the porcelain white. 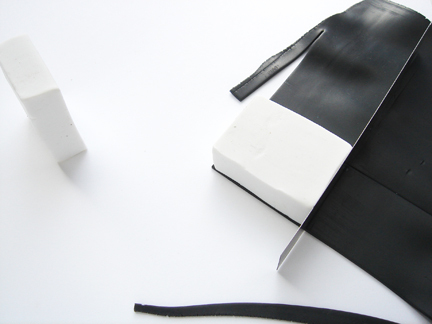 Then mix the black block with an equal amount of the porcelain white. It will look slightly lighter, but bakes up a beautiful black color. 1. 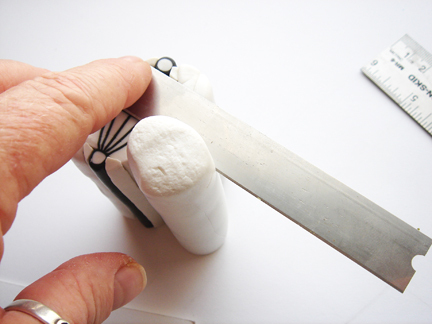 Trim off the ends of your cane (so far). 2. Stand the cane on one end. 3. Add the round cane rods that you cut in part 3 to the block you have standing on end. They go at the four points of the diamond image. Trim off the excess from the four round rods. 5. 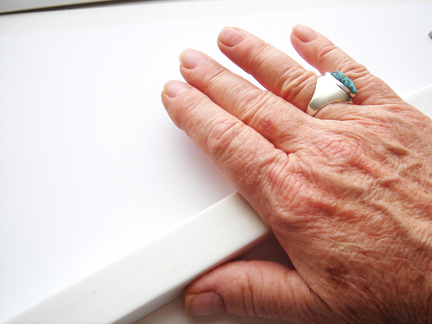 Roll a small coil of white clay about 3/16″ and using your thumb and forefinger press in to a triangle shape. 6. 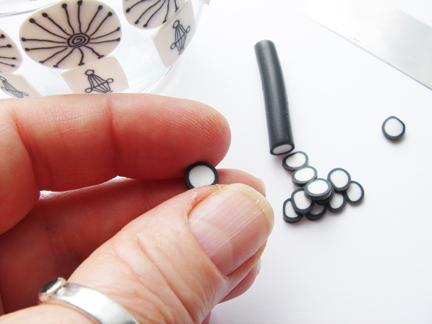 You will need 8 of these as long as your image block is high to go around the small rods in white wrapped in black. 7. Tuck one of the points of the triangle in to the space under the coil, just enough to fill that space, not enough to move it. 8. Press them in like this. I have this turned on its side so I can show you how it is done. You do not want to lay this on the round cane and press it in, it has to be standing so you do not flatten the round rods. 9. Fill all of those spaces on the image block. 10. 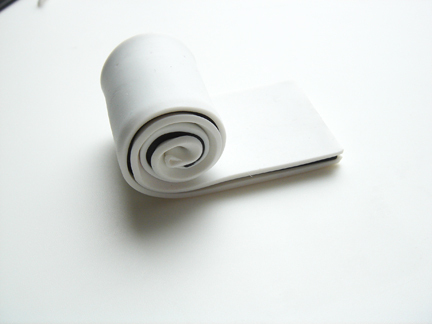 Roll a coil of white clay that is about 3/4″ in diameter and a little bit longer than the length of the image block. 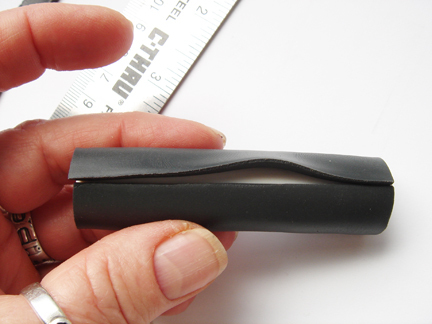 Trim off one end so it has a flat edge. 11. Cut the coil in half through the length. 12. Add one half flat side in, to the top right side of the image and add the other one to the bottom left hand side of the image flat side against the image. 13. Roll another coil that is the length of the image block’s height. 14. Now cut that one in half through the length. Add those to the other diagonal spaces. The top left and the right bottom of the image block. 15. 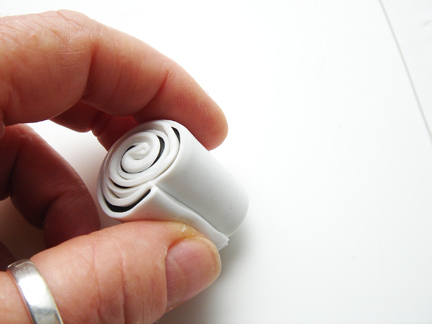 Roll out a coil of white that is about 3/8″ in diameter. Press it into a triangle shape. 16. 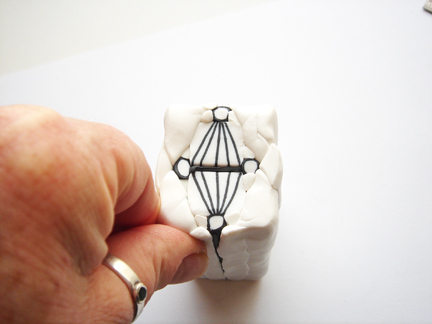 Add those triangles to the left and right side of the image right in the middle of the two half coil on each side. 17. 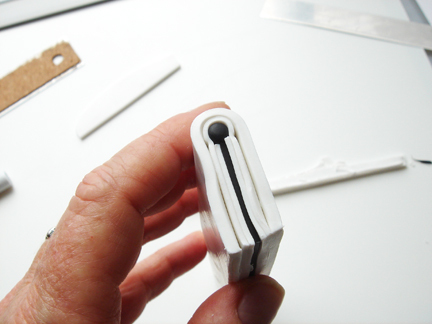 Roll out another small coil of white about 3/16″ and press into a triangle. This you will use to fill in the two spaces on the top and the bottom of the image block where there is a dip on the top and one the bottom. You will need four of these triangle pieces. 18. Here the image block is filled in all the spaces with one left to trim off. It is basically in a rectangle shape. 19. 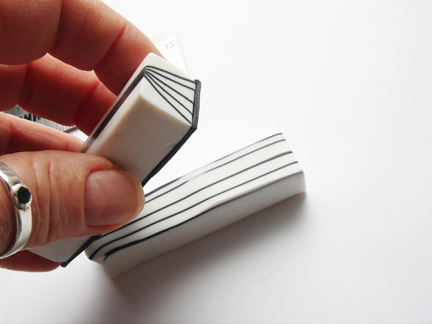 Pinch the block in the top corners and in the bottom corners to make them more defined and more like a rectangle. Pinch them all the way down the image block side in all 4 corners. 20. 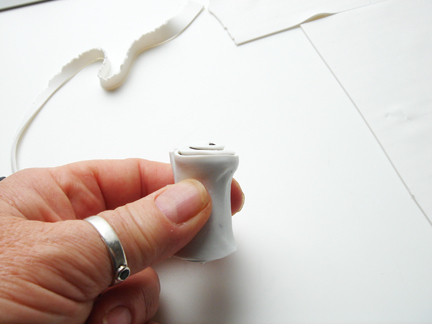 Roll out a sheet of white on the thickest setting in the clay machine. 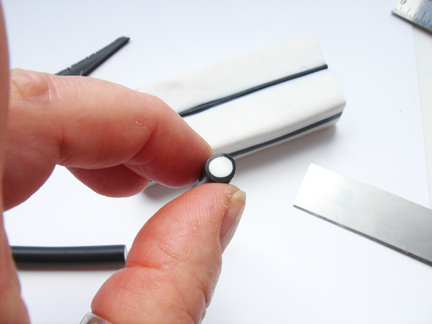 Trim off the leading edge for the straight edge. Lay the rectangle image block on that edge. 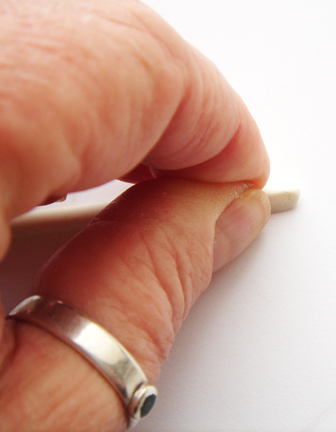 Trim off the right and the left side of the block to make the sheet that width. Wrap the sheet around the rectangle image black sides. 21. 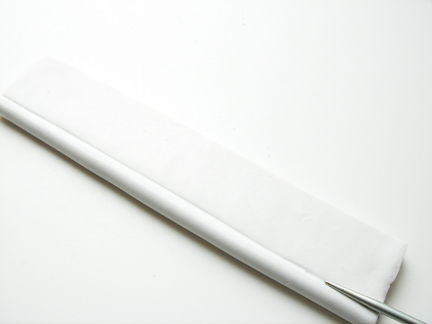 Wrap it up and trim the other end of the sheet to match the beginning of the sheet. 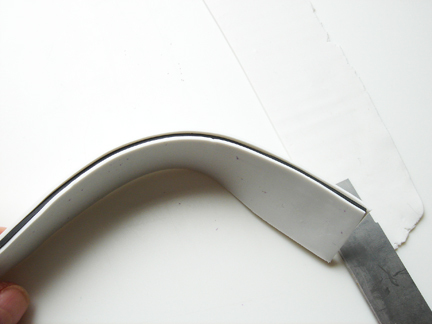 Smooth the seam with your finger. 22. Press on the side of the image block to compress together and reduce. 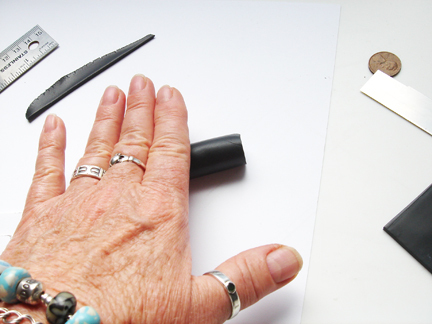 Go slow and use the flat part of your palm (or the flattest part) usually the heel of your palm. That heel of your palm is the strongest too. Press down as evenly as you can. Turn the block 1/4 turn to another side and press again the same way. You have now done all four sides. 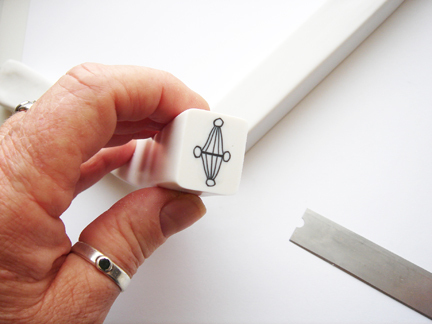 Flip the cane(image block) from end to end and proceed to do all 4 sides again. then repeat, doing this over and over until you have reduced the cane down to about half the size. 23. When I have reduced the cane down far enough I then I hold the cane with one hand and use my upper palm and slide my hand down the cane to lengthen it. Always turning it one-quarter turn now and again and then I flip it from end to end and do the same thing from the other side of the cane. This makes it smooth and stretches it out. 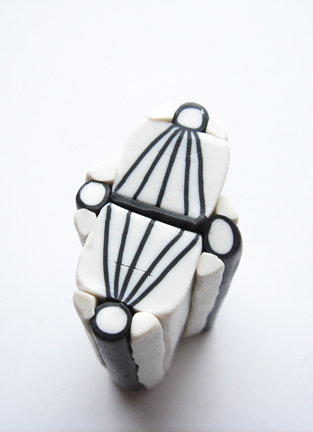 I am gliding the top of my palm over the clay. 24. 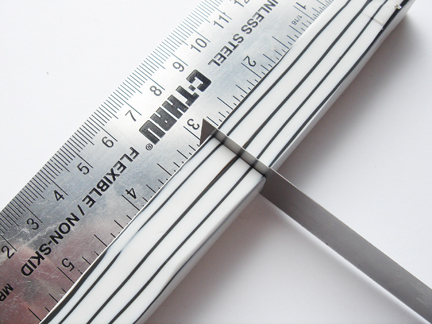 When you have reduced it down to about 1″ by 3/4″ cut it in half. 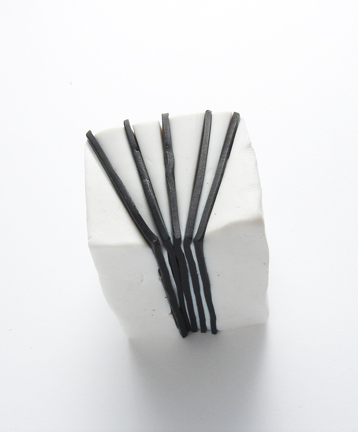 Come back for the next one we are going to cover a votive in all the black and white canes we have made so far. Happy Saturday Sunday. I would have got this up on saturday, but I spent most of the day on the couch being a whiny waawaa. I got the cold. So I didn’t get to go hang out with my friend Jodi and have so much fun making crazy stuff and staying up all hours of the night 😦 So much for leaving town. Since Madi has been on the planet I have gotten more colds than I have had in my entire life time. 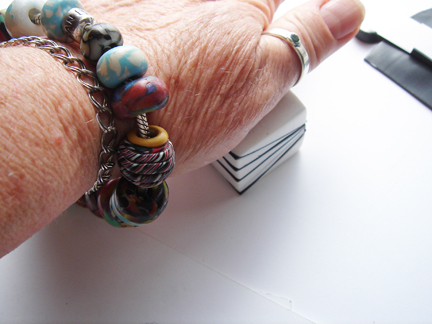 I am having a giveaway on Mary’s Graces blog or I am the one giving the blog giveaway item this week. 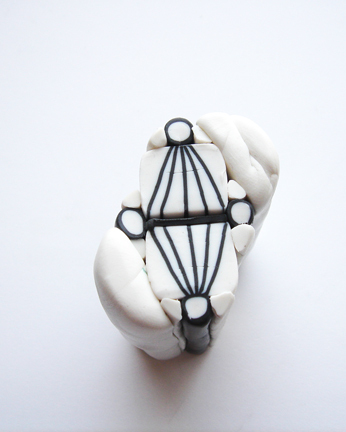 I am a member of the Mary’s Graces Team on Etsy and it is a wonderful group of artists I am so proud to be a part of. Do not comment here, comment over there. Come join us! 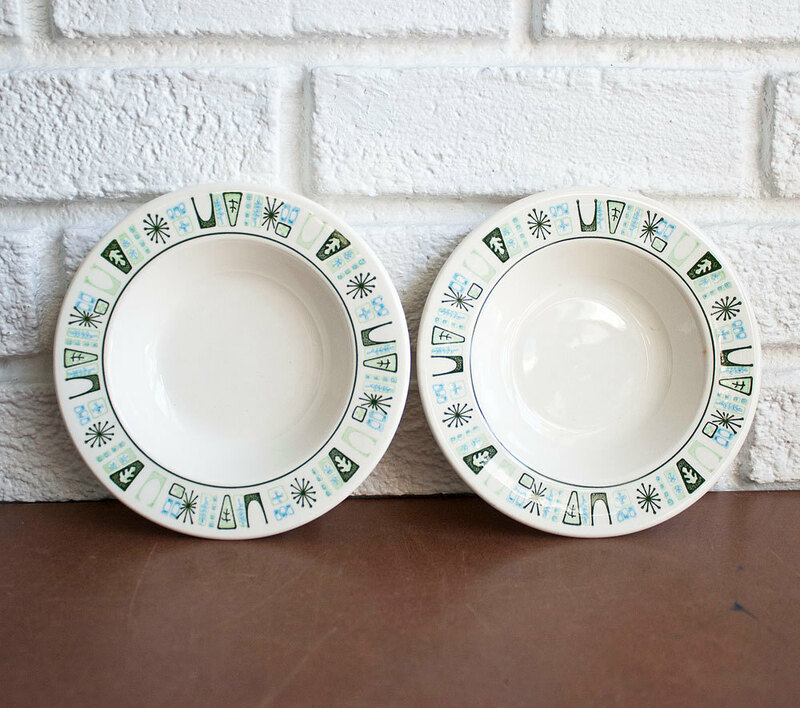 You can find these Atomic age beauties on Etsy. 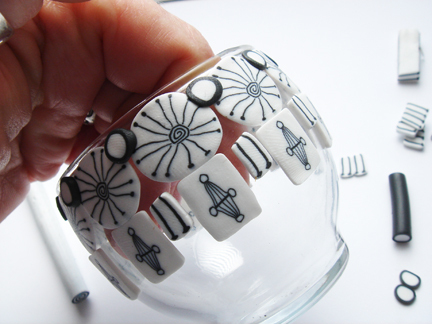 Set of 8, now that is really amazing. And the price… even more amazing. 2. Sliver off some of the clay from the lines if they have white over them from reducing the cane. Do not take off a lot. Make sure lines are showing on this side of the cane. 3. Cut cane in half. 4. Here is what it should look like. Anything close to this, you have done a good job, pat your self on the back. Pretend I did it. 5. Place on the sheet of black clay rolled out on the 5th thickest setting. Fan lines down. 6. 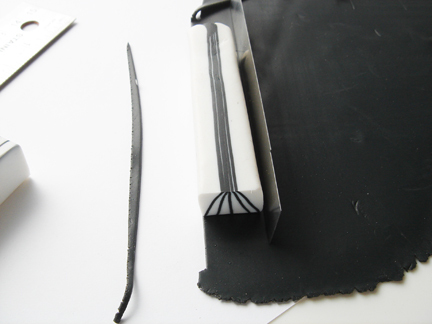 (really about step 40 something) Trim away the black so you have a sheet of black the same size and your cane block. 7. There you go, now place the sheet on top of the other half of cane you have mirroring the top cane with the cut edges on the same end. 8. Press together gently. You could if you wished reduce this cane down here and make an awesome border out of this, can you see it? 9. 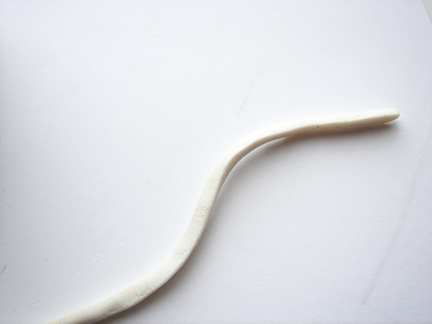 Roll out a coil of white that is over 2 1/2″ long and about 1/2″ in diameter. 10. 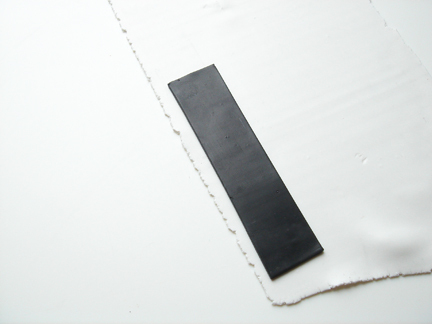 Place the white coil on the black sheet that is rolled out on the 5th thickest setting. 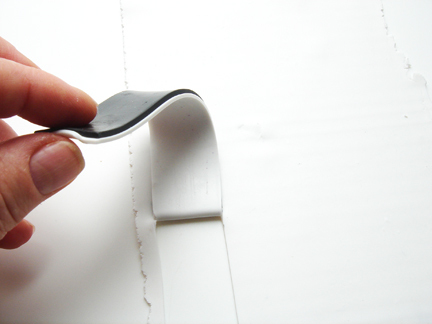 Trim the sheet so it is the same width as the coil is long. 11. 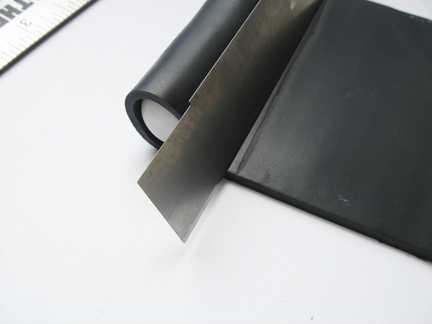 Roll up in black sheet. 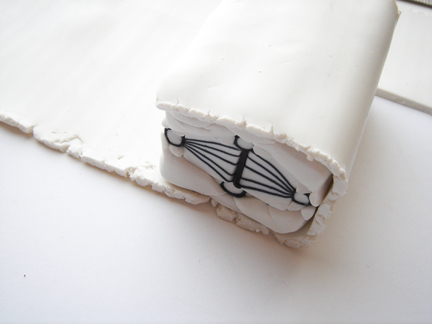 Roll over the edge of the beginning of the sheet over the other side of the sheet to make a mark. Roll back away from the mark. 12. Here you can see the mark I made with the edge of the clay. 13. 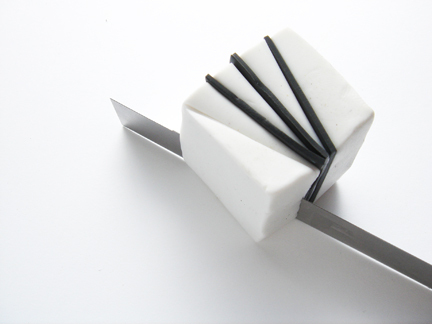 Place the edge of the blade on the inside of the line mark you made or closest to the cane. Tilt the blade towards the cane. Cut at this angle. 14. 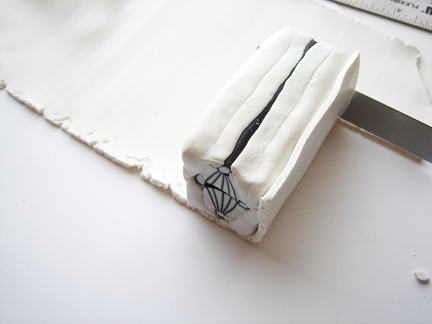 Roll up and press the edges together. 15. 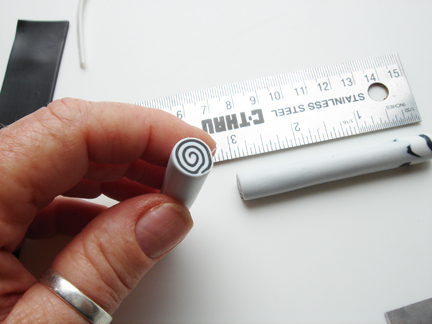 Roll the coil down and extend the length. 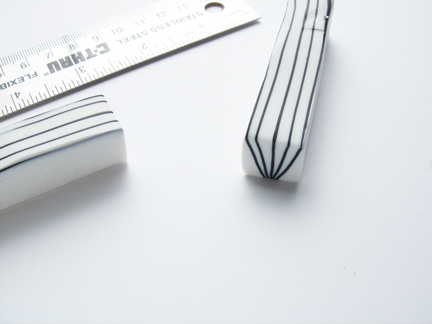 Roll down to about 1/4″ in diameter. 16. It will look like this. 17. 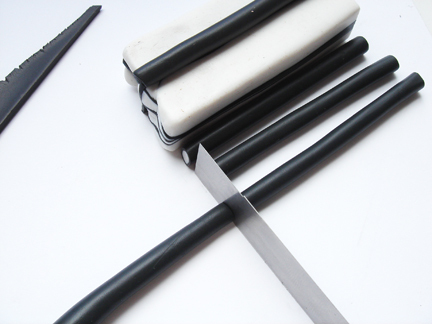 Cut 4 pieces the length of your cane block. 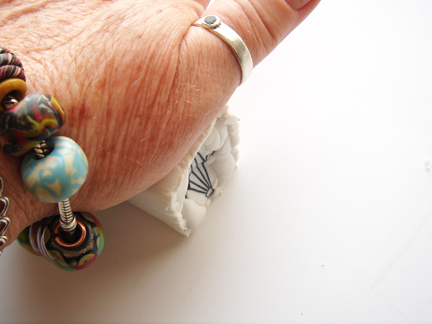 All of the sudden my Blog is working wonderfully, I hope your is too!! In IE8. Wooooooooooo Whoooooooo!!! Thank you Blogger! 1. 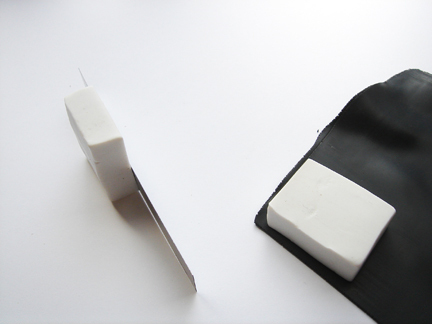 Stand the cane on the end so you are looking at the 1″square end. 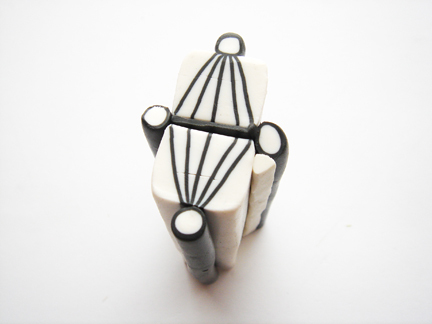 Roll out some of the black clay on the 5th thickest setting in your clay machine. Cut down through the cane right in the middle. 2. Leave the one half standing where it is and take the other half and place it on your black sheet of clay. Remember the orientation of this one because you are going to put it back exactly the way it was. 3. 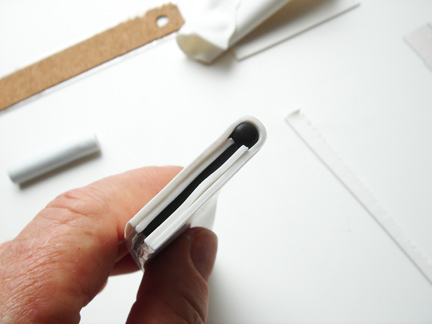 Trim away the black so you have a sheet of black on the white half. 4. Put the one half back with the other and lightly press them together. No smooshing here. Lightly tacking is good! 5. Next cut you make is going to fan out slightly on the left, maybe a quarter-inch, maybe less. 6. 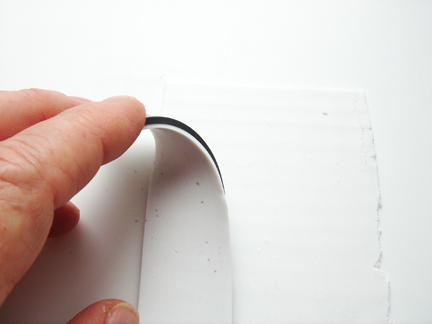 Take away the cut section and place it on the back sheet and trim away so you have a black sheet on this section. 7. Place that section back with the block. Tack together again. 8. Now make the same size cut on the right of the black. If you stand up when making cuts and look down over the top of your block as you cat you can make sure the blade is going straight up and down. 9. Place it on the black and trim a sheet to go on the white and place it back together and tack it together. 10. Make another cut on the left side. 11. 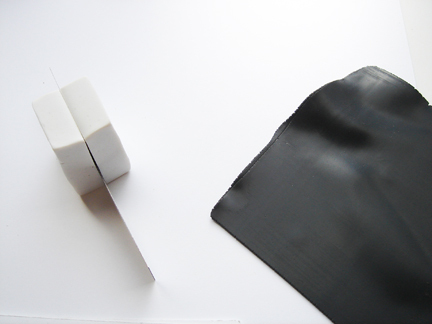 Black sheet again and put it back and tack. 12. Cut on the right side. 13. 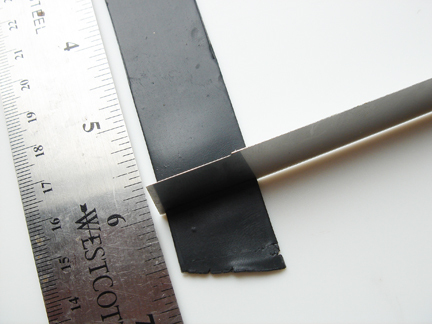 Trim the black sheet to match and put back together with black and tack together. 14. 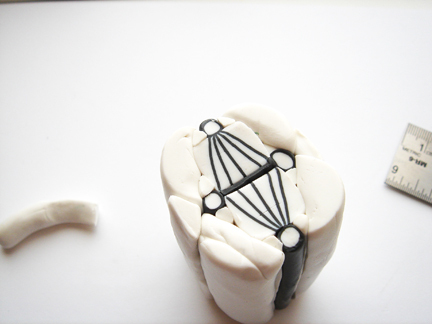 Press gently on one side of the block with the flat part of your palm. 15. 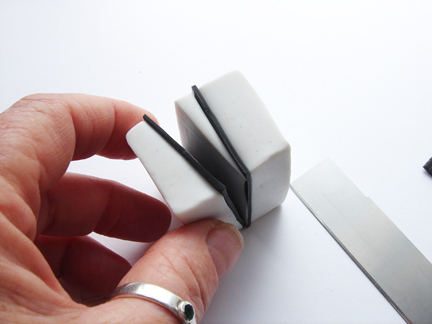 Rotate the block one-quarter and press gently on the side with the flat of your palm. You are press on the sides not the ends with the image you made on them. 16. 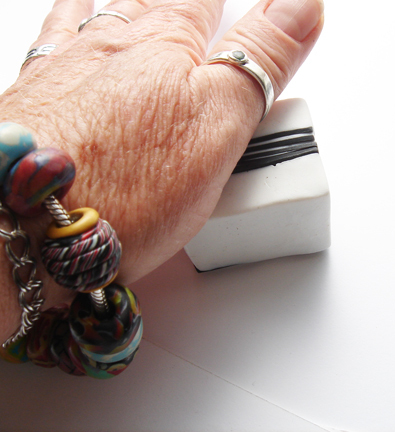 Rotate the block one-quarter and press gently on the side with the flat of your palm. 17. 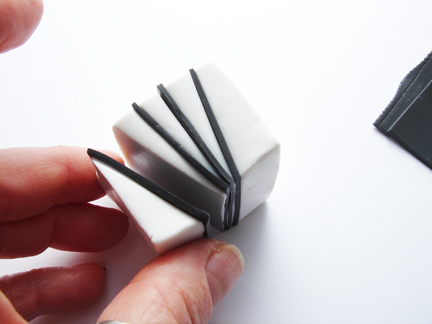 Rotate the block one-quarter and press gently on the side with the flat of your palm. 18. And then back to the beginning. Now flip the cane from end to end and do the pressing steps all over again. This is slow and even. 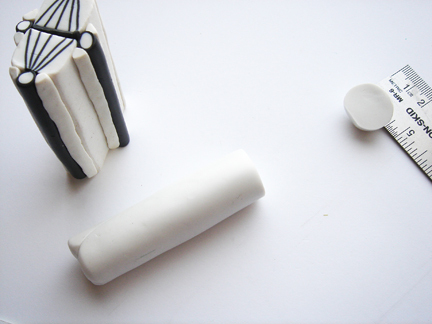 Flipping the cane block from end to end when you do all four sides. 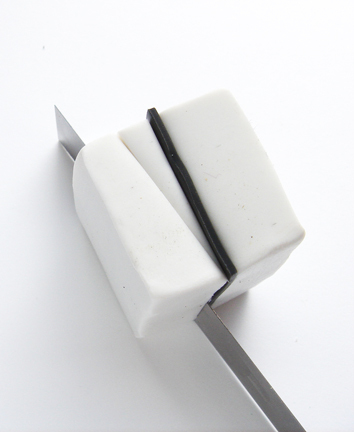 The cane block will start to get smaller and longer in length. 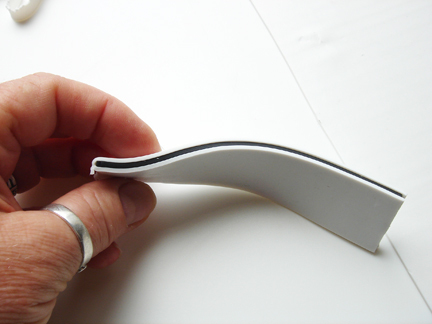 Once it starts to get about and few inches long you can hold one end and slide you fingers over the side to lengthen. Do all four sides and then flip from end to end again. 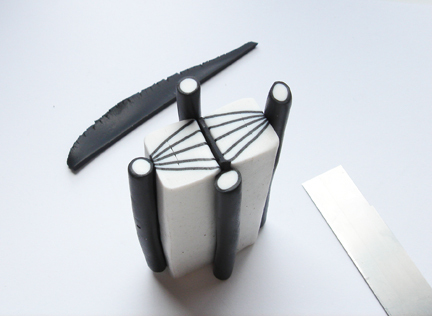 You want to do this until the cane block is about 6 and a half or seven inches long. 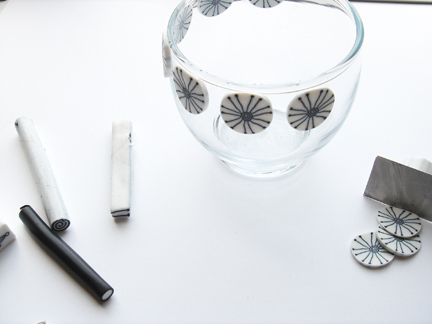 Mix the black and the opaque white with equal amounts of the porcelain white until it is one color. 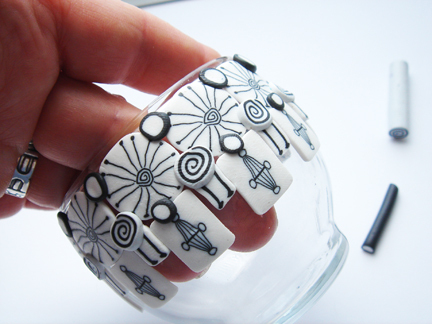 You do not have to do this but I like the consistency of the Porcelain white and it keeps my colors soft and pliable. If your porcelain white is not soft this will not work. as always, thank you so much for looking. We both appreciate you immensely. 11. 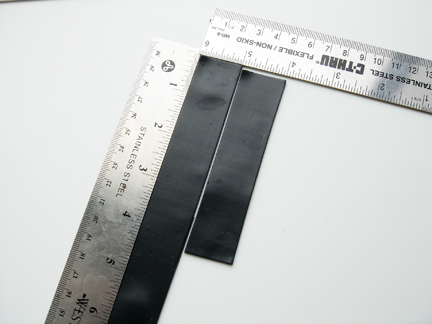 Take the 6″x 1″ strip and trim all of the edges so they are straight. if you already did this, yay! 12. 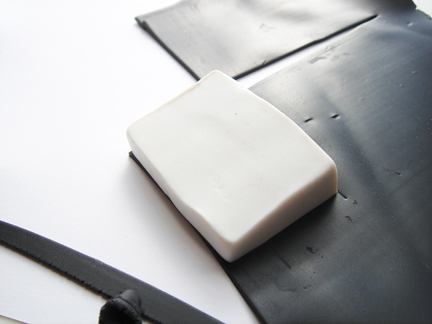 Lay the strip on top of a white sheet that has been rolled out on the 4th thickest setting in the clay machine. 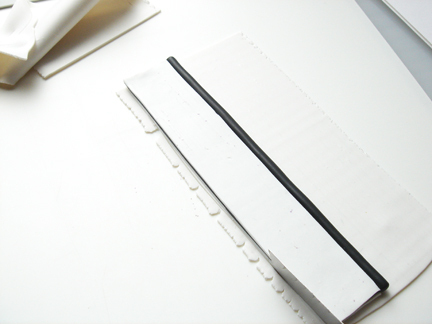 Trim the white sheet to the top, the bottom, right side and the left side of the black sheet. 13. 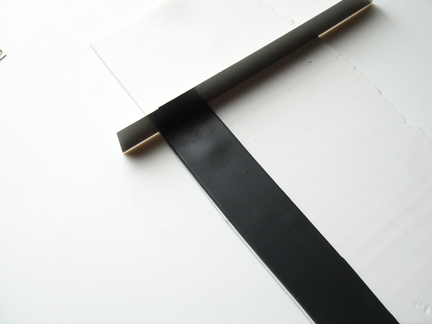 Lay the black and the white strip on top of the extra white sheet. 14. Now trim the bottom white sheet to match the one you have laid on top of it. 15. It will look like this. 16. 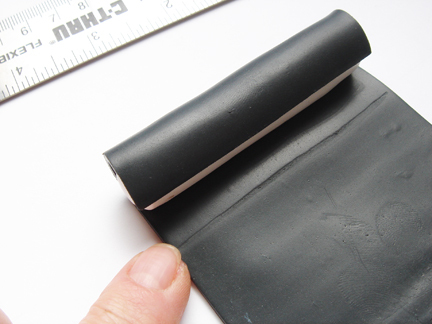 Roll a coil of black that is 3/16″ in diameter and the length of the stacked sheet you just made or 6″ long. 17. 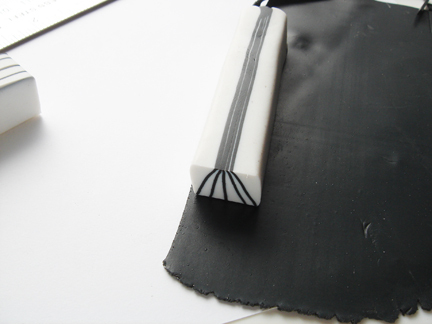 Place the coil of black on one end of the stacked sheet. 18. Roll out some more white on the 4th thickest setting in the clay machine. 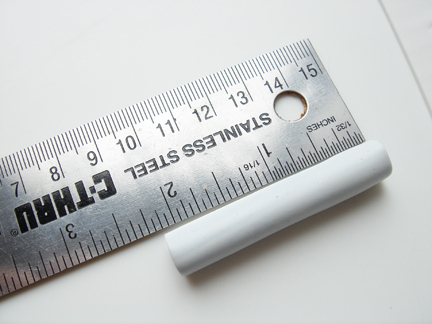 It will need to be at least 6″ long by 2 1/2″ wide. 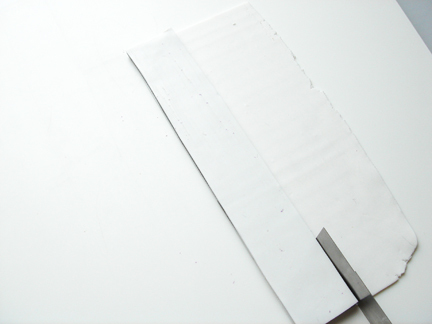 Place the stacked sheet and coil on top of the sheet of white. 19. 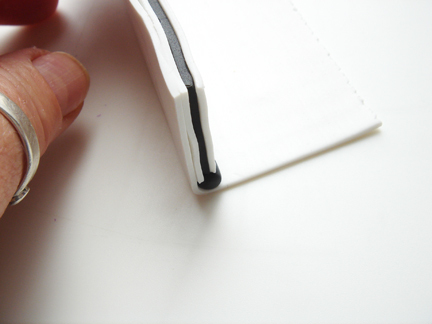 Trim off the left edge of the sheet to match the stacked on and the coil. 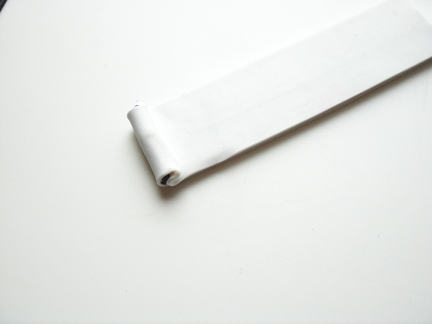 Trim the top and the bottom to match the top and the bottom of the stacked sheet and coil and fold the sheet and the stacked one and coil over to the right on the new sheet of white. 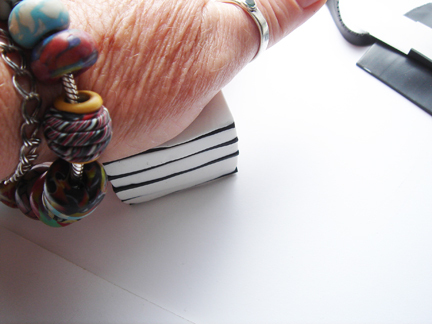 You will be covering the stacked sheet and the coil. 20. It will look like this. 21. 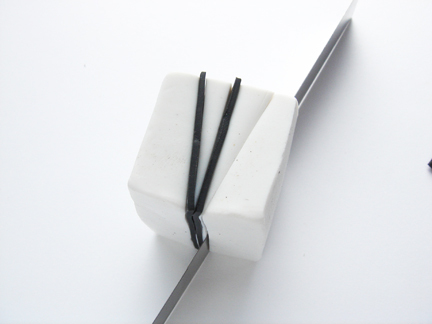 With a knitting needle or pointed tool run it down the length of the sheet where the coil is. Do not press very hard, just push the clay in there. Do both sides of the new covered stack. 22. It will look like this. 23. 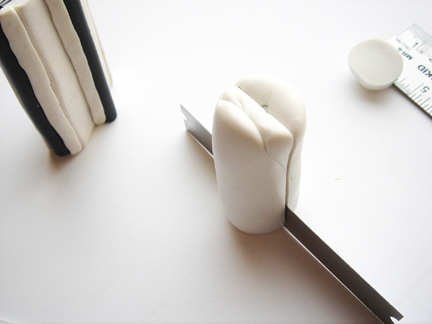 Cover the whole thing with another sheet of white clay that is rolled out on the thickest setting. 24. It will look like this. I thought I would start another cane series while I had some spare time ;-D and I thought that playing in black and white would be great fun for me and hopefully you will enjoy it too! I love black and white, simple, clean, and only two colors to purchase. 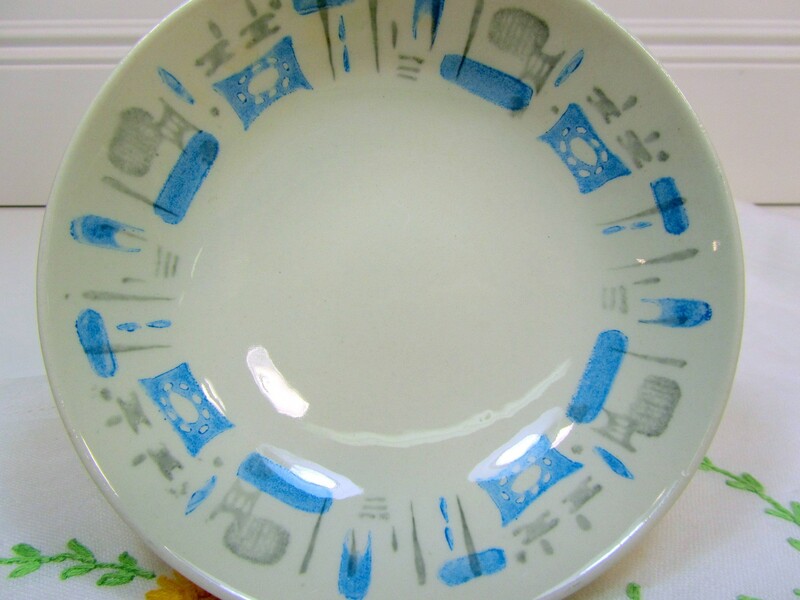 I am fascinated by the Atomic age designs in the 50’s. 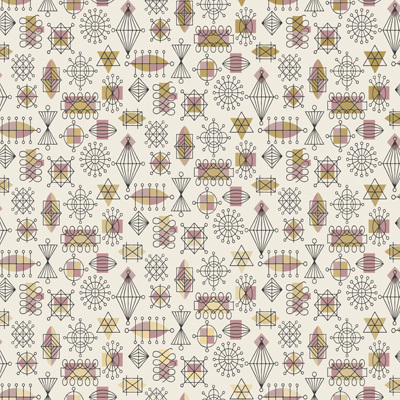 You can find examples by searching “atomic prints fabric” in google images, fun stuff, reminds me of the Jetson’s. They first aired on TV in 1962. I spent just a little time in this blog with all of their 40’s, 50’s, 60’s and 70’s stuff and I feel better. A walk down memory lane for me. What a Blast. Mind you, I disliked this stuff very much as a kid growing up with it, but I feel comfort in it now and miss it a little. 1. 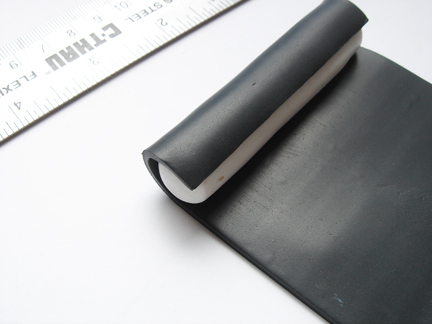 Roll out the black on the 3rd thickest setting in the clay machine and cut two strips 1″ wide by 4″ long and one 1″ wide by 6″ long. 2. 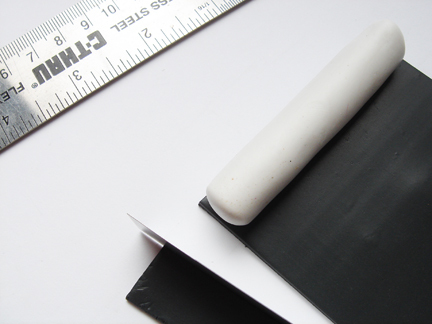 Put aside the 6″ long strip for a bit and roll out some of the Opaque white on the 4th thickest setting. 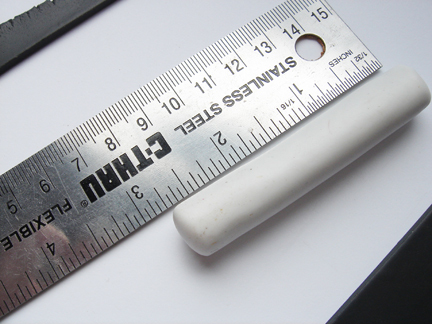 Make the sheet of white at least 8 1/2″ long. 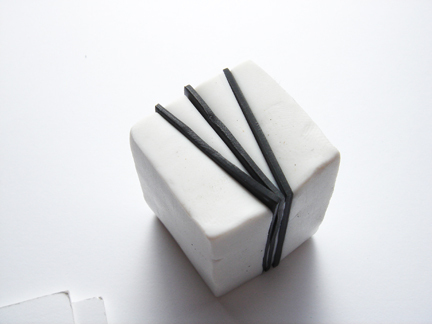 Place the black strip on the white clay. 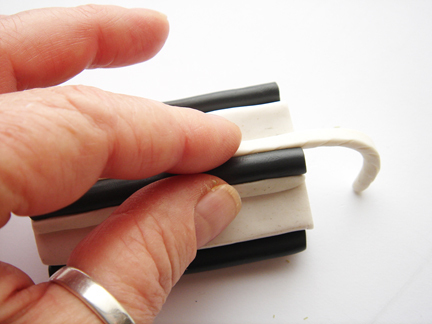 3.Trim the white clay on the left and the right side of the black strip and then trim the bottom edge. 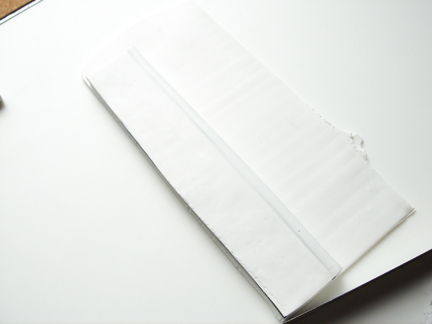 Fold the black and the white section over on the white sheet. 4. 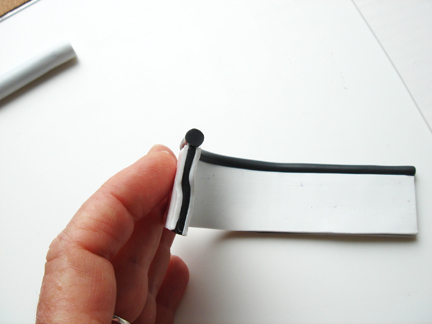 Trim around the black strip again and cut off the end too. Your strip will be covered like this. 5. Tuck the end that is covered with white (the end that I am holding in the picture above) in and roll up the strip like a cinnamon roll. 7. 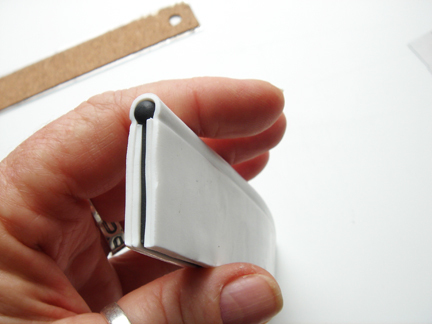 Press the outside edge that is white to the coil. 8. 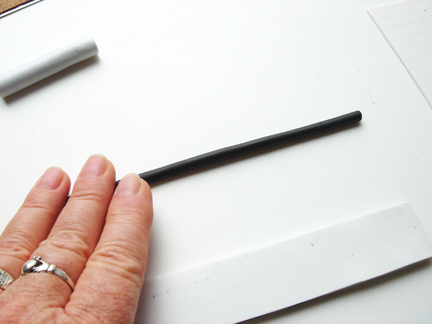 Pinch a little waist in the middle of the coil(cane) by placing the thumb and forefinger of one hand in the north and south position on the cane (coil) and the thumb and forefinger of the other hand in the east and west position of the coil/cane. Push together on all sides at once and rotate the coil/cane up and to the right or left a little(which ever feels right to you). Pinch again and continue rotating and moving up the cane till you get to the end. 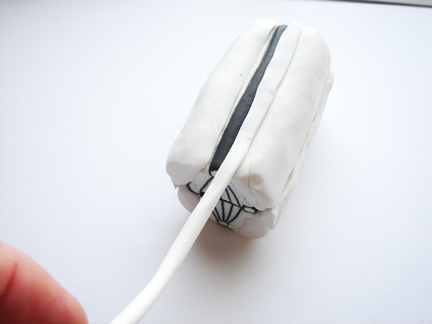 Turn the cane/coil over and starting the middle work your way up the other end of the coil. 9. 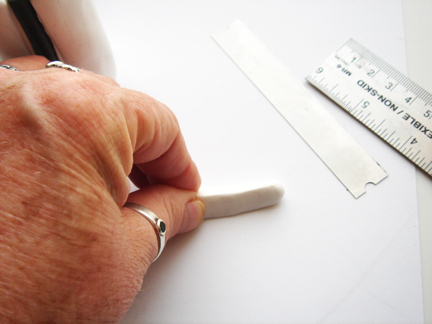 When you have reduced the cane/coil to half the size roll on the work surface to smooth and lengthen while extending. 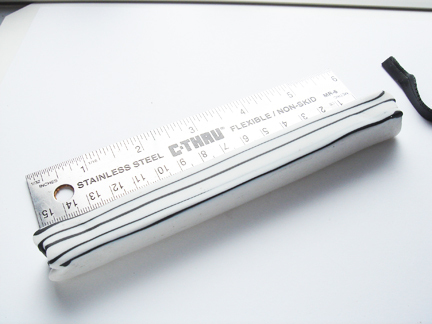 Roll out to about 6″ in length, roll down to about 3/8″ in diameter. 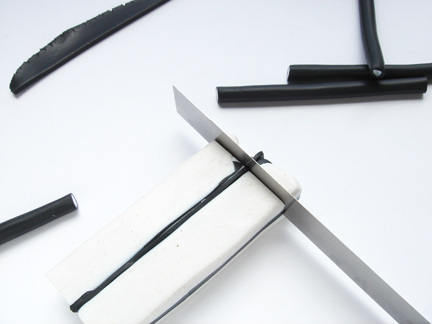 Cut the coil/cane in half. 10. Trim off the other end till the distortion is gone. 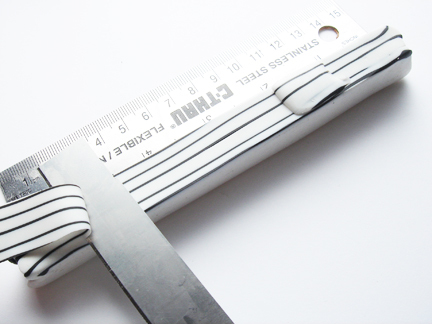 You will need 2″ for the cane we are going to make. Put the rest of the cane/coil aside for later use.